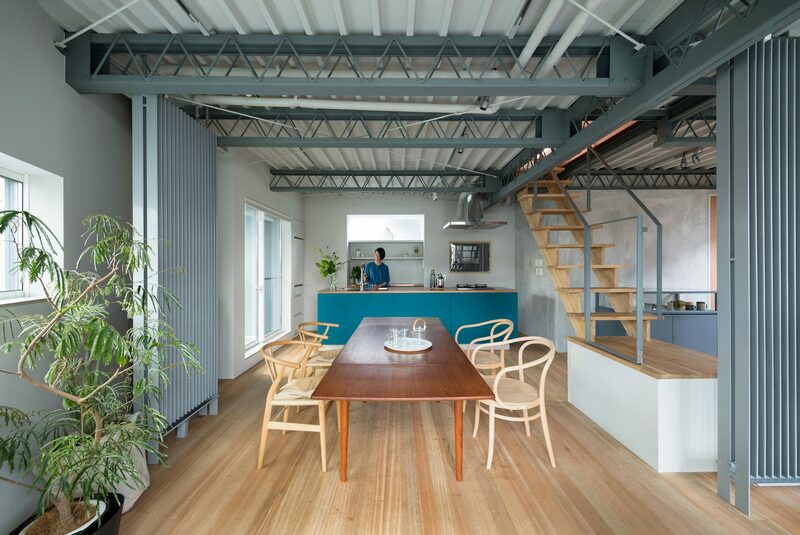 "-A node that connects a commercial and residental area"
"Kamiyama Residence" is a double-story house on top of a design office renovated from a forty year old,steel frame structure which had been left untouched for several years. 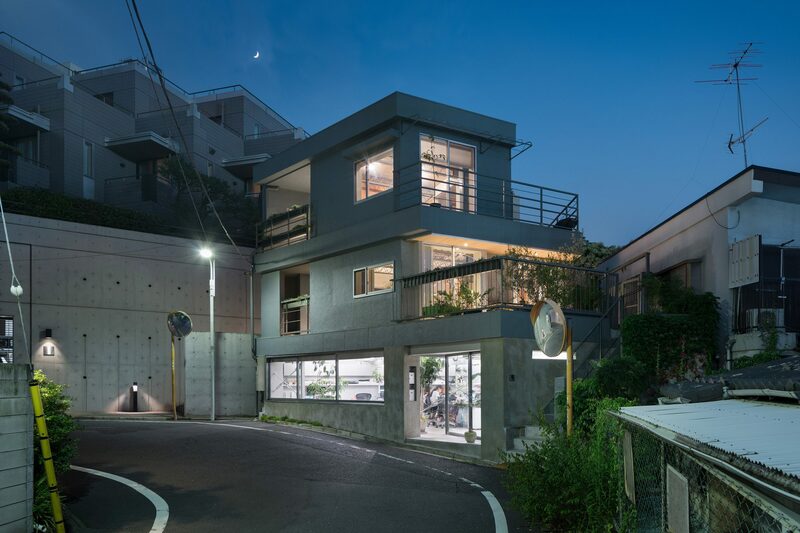 The street leads to a quiet residential area adjacent to Okushibu,with a number of embassies. 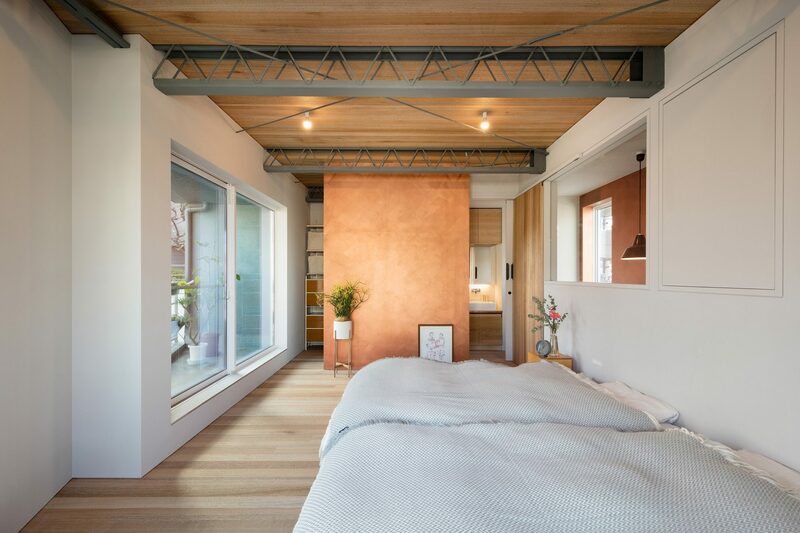 We started planning this building with the idea it will be a case study for a nodal point connecting the two areas -even though it's only a small project. 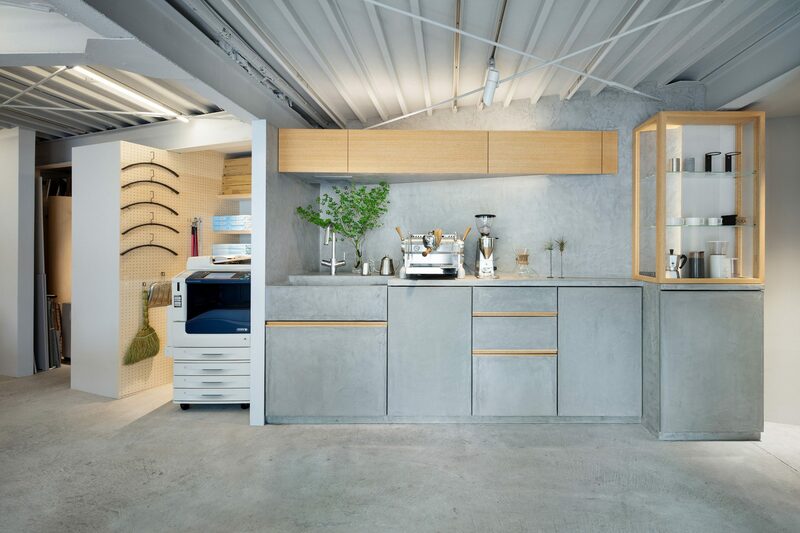 The ground floor , originally a garage.
" 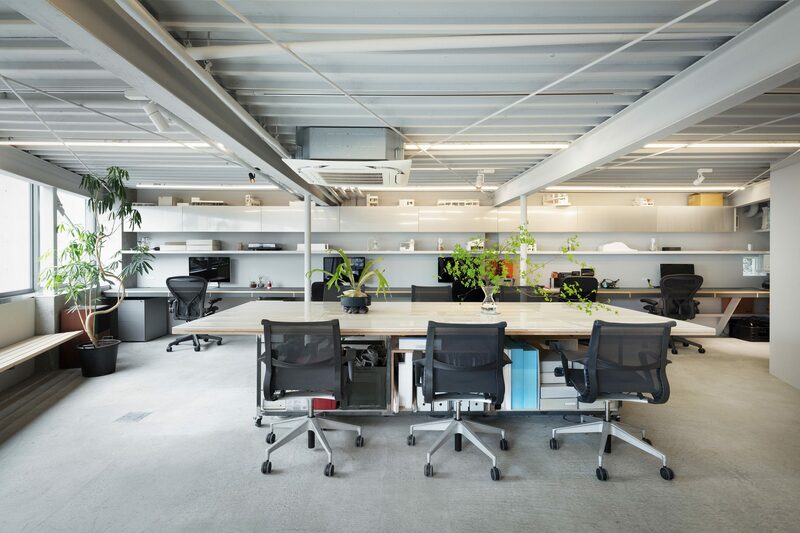 Case study for a work space that connects to the cityies"
As a Pilotis structure, The office space on the first floor required a lot of reinforcement. since it was a Pilotis structure. 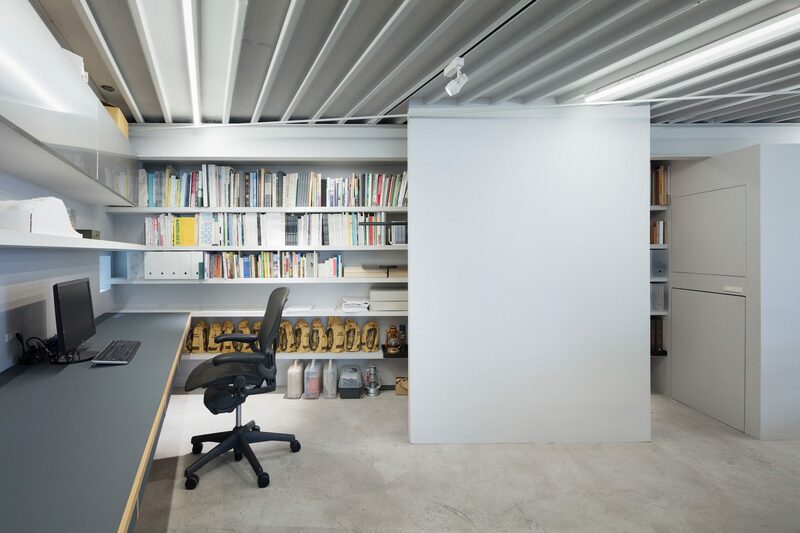 In terms of business as a design office, the space consists of materials with different gray tones to handle a lot of white objects such as paper and models. 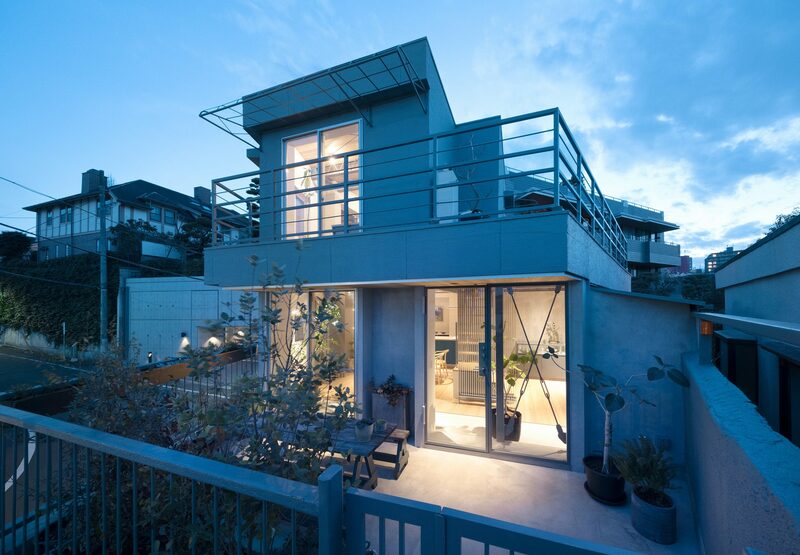 It iswas also a space opened to the city that incorporates more naturaloutside light with a large glass opening. With this transparency, I think that setting up a custom espresso machine in front of the entrance instead of the office sign, and showingproposing work style to the city is also a unique proposal in the area to the city. "A house that can be communicated in the kitchen"
The design started by considering where the kitchen is placed in the house. We always suppose the kitchen as where the communication creativities are born more than just as a base for our daily life. For those who live here the kitchen is the important central presence. Consequently, the island kitchen was prerequisite as a center of the 2nd floor. Experimentally, copper was used on top of the island counter to enjoy the process of oxidizing and tracing the history of the family. In front of the counter is a shelving system with concealed speakers, covered with Turquoise blue mesh. These became characteristic of the space. Music is very important for cooking and talking and- as music is essential for those who live here, this kitchen became special through appearing to the senses beyond the visual. 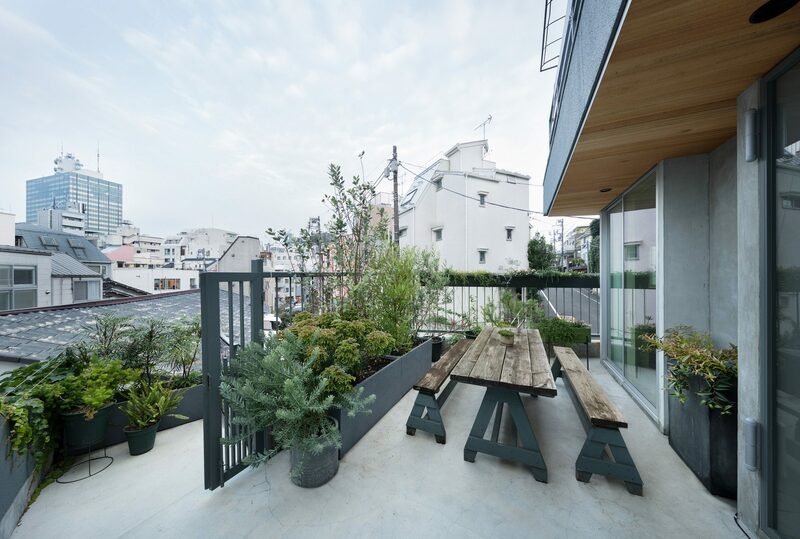 By planning to adopt the radiant cooling and heating for air conditioning that is less for the residents and architecture, the big opening with glass was designed in to bring in the greenery on terrace and neighborhood environment seamlessly. 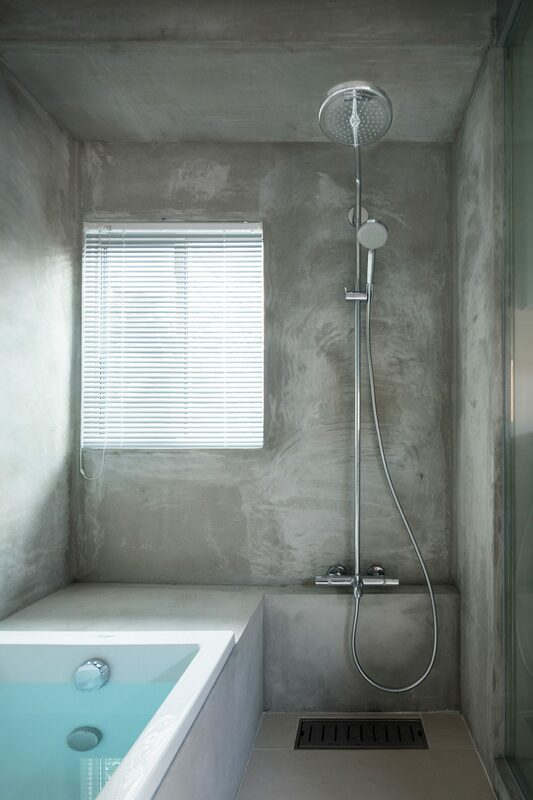 For the bathroom, we chose to use the conventional construction method but the Mortar plaster work became the actual finish. 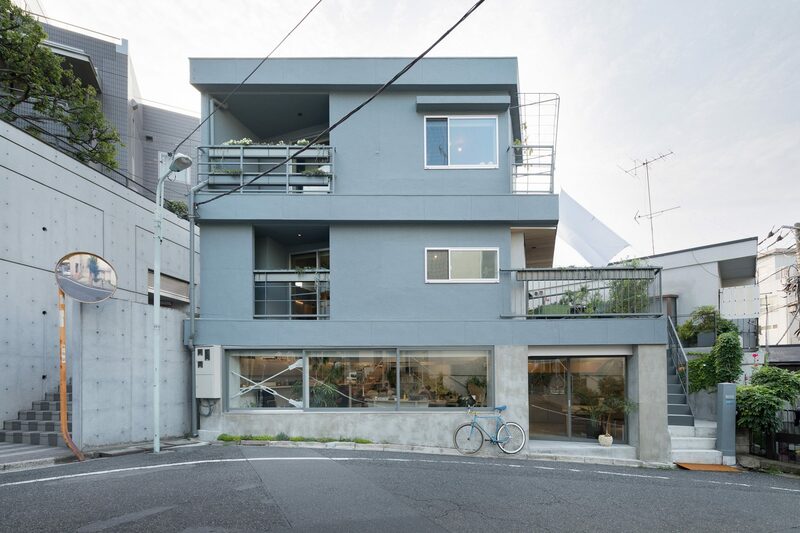 Just as Ground floor, the residential area's color scheme was based on gray with material and color added so that each every direction would have different look experimentally. 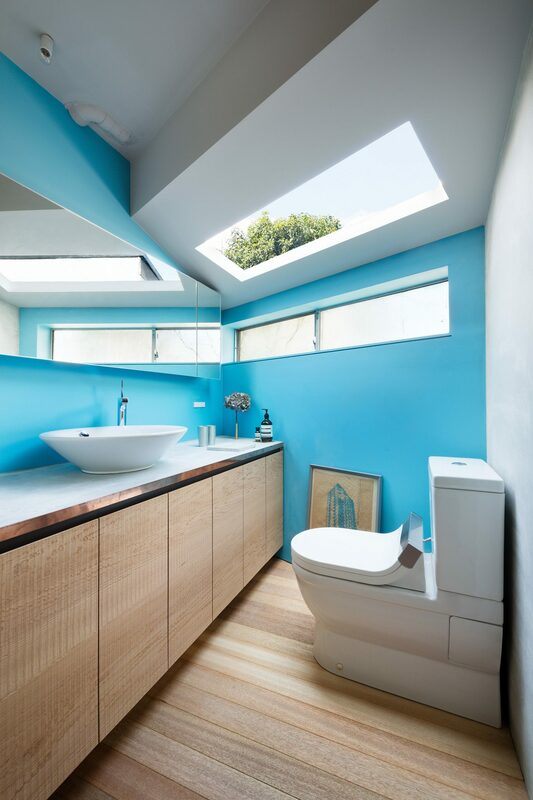 Vivid blue was applied to the bathroom. The color was chosen from the ivy that covered outside of the building. I wanted to mix the heaviiness and coolness of steel-frame architecture with natural textures. In the bedroom on the top floor, you can see the scenery on and off the hill from the wide opening and the window on the verandah. A nice breeze goes through the space from the Southwest verandah to North-east terrace. I try to achieve the open space where the light and wind go through the room. 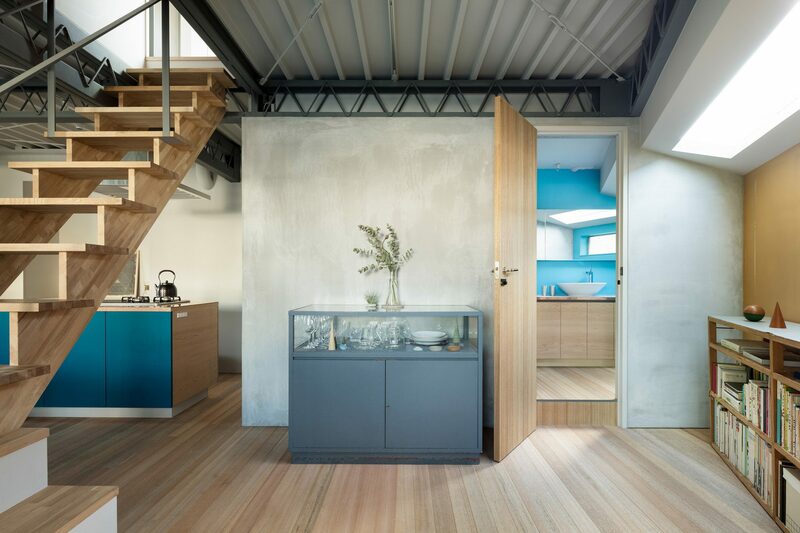 The material for the ceiling became Laun to match the flooring which gave different feel to schelton 2nd floor. Copper brown for Walk-in-closet wall became accent.
" 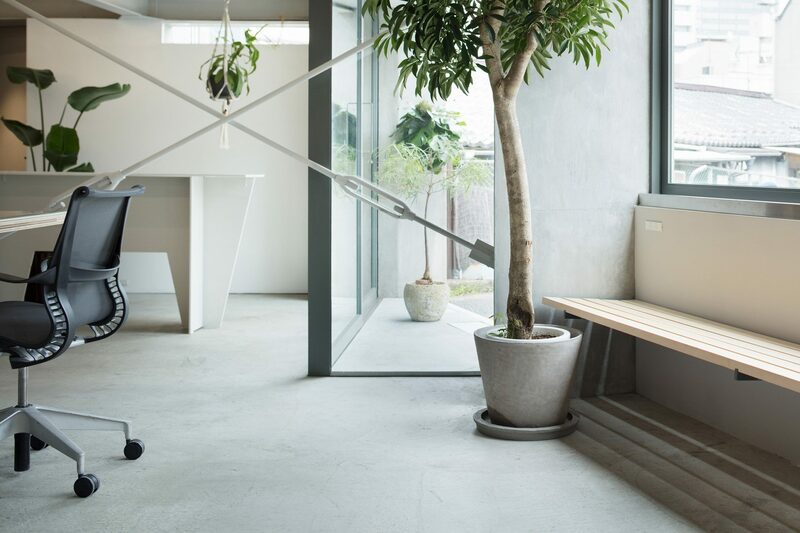 Space that keeps growing"
Kamiyama Residence was based on gray, the middle of white and black, with the aim to become a node that connects two different areas. Bese on Besed on gray that material gives, I used materials that are-usually not used at home experimentally. I look forward to the observing the changes and patina that collect in the future. The home should not be at it’s best when it is first built. After being lived in and many things added by the residents, it becomes real pleasure to see it evolve. One may paint walls or perhaps new planning for terrace will eventually start. A house grows with the client family. The space begins to grow up only once residents move in.